WASHINGTON (Reuters) – U.S. Attorney General Jeff Sessions on Monday overturned a grant of asylum to a Salvadoran domestic abuse victim, potentially excluding immigrants seeking refuge from sexual, gang and other forms of violence in their home countries. The decision to refuse asylum to the Salvadoran woman, whose former husband raped and beat her for 15 years, narrows who can qualify for asylum when they become victims of criminal activity, as opposed to government persecution. Sessions’ finding followed his unusual move to intervene personally in the case known as the “Matter of A-B-.” The woman, who is only identified by her initials, had won an appeal to the Board of Immigration Appeals, which had overturned a lower immigration court judge’s denial of her asylum petition. “In reaching these conclusions, I do not minimize the vile abuse that the respondent reported she suffered at the hands of her ex-husband,” Sessions wrote in his order. “I understand that many victims of domestic violence may seek to flee from their home countries to extricate themselves from a dire situation or to give themselves the opportunity for a better life,” he continued. “But the ‘asylum statute is not a general hardship statute,'” he said, citing an earlier immigration case. An attorney for A-B, Karen Musalo, called the decision “devastating” and said it had been anguishing for her client. “You have a woman who barely survived more than a decade of horrific violence, who finally feels that she secured safety … and now she’s thrown into total turmoil again,” said Musalo, who directs the Center for Gender and Refugee Studies at the University of California Hastings’ law school. The woman could still potentially appeal the case again to the Board of Immigration Appeals, then a federal appeals court and ultimately the U.S. Supreme Court. Sessions’ decision drew immediate rebukes from dozens of immigration rights advocate groups and lawyers. Some said the decision could have wide-ranging impacts on immigrants fleeing gang violence and gender-based violence, including female genital cutting or honor killings. Michelle Brané, director of the Women’s Refugee Commission’s Migrant Rights and Justice program headquartered in New York, said, “Attorney General Sessions’ decision to limit the reasons why people can claim asylum is a devastating blow to families who come to our country seeking protection and safety. U.S. House of Representatives Democratic leader Nancy Pelosi joined those denouncing the decision. It was not immediately clear how many cases the decision could affect. Unlike the federal judiciary system, U.S. immigration courts fall under the Justice Department’s jurisdiction, and the attorney general can intervene. In immigration court, certain opinions published by the Board of Immigration Appeals, the highest immigration court, serve to set national legal precedent. However, as the United States’ chief law enforcement officer, the attorney general can intercede in its decisions to shape law. Sessions has been unusually active in this practice compared to his predecessors by exercising his intervention authority to make it harder for some people to legally remain in the United States. He remanded the case of A-B- back to Judge Stuart Couch in Charlotte, North Carolina, for further proceedings. An investigation by Reuters last year found that Couch orders immigrants deported 89 percent of the time. Monday’s decision marks Sessions’ latest effort to greatly restrict immigration. Cracking down on illegal immigration and tightening legal immigration were major themes of President Donald Trump’s 2016 campaign. 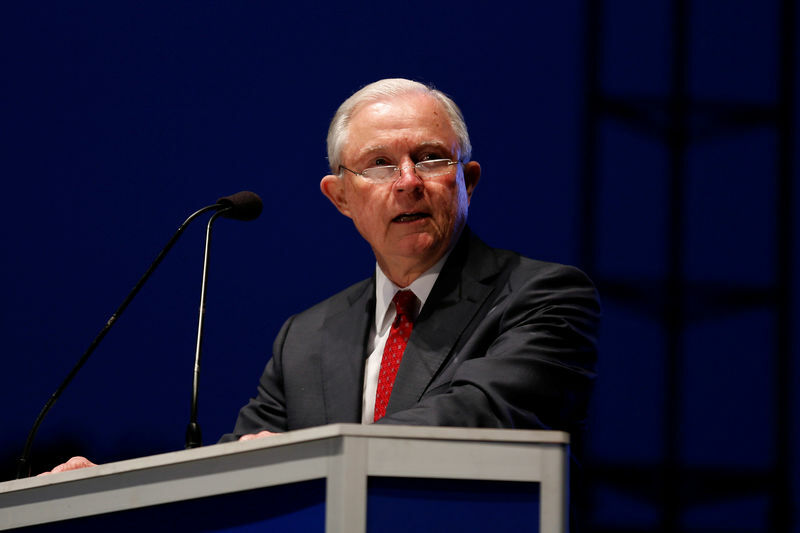 Earlier this year, Sessions declared he would attempt to ensure that every person who crosses the border illegally would be prosecuted, and he has staunchly defended a new policy of separating women and children at the border, including those seeking asylum.